A bunch of the restrictions listed in the previous 2 releases looked like civil speed restrictions. Could explain why CPW hasnt made the list for review yet. Yup. I’m also *pretty* sure that some (most?) of the GT speed restrictions on CPW are baked into signal spacing there — they were installed at the time of the resignalling of that corridor. This obviously complicates efforts to remove them. It should be noted, though, that some of the changes on that list involve GTs. The QB exp ones come to mind. All I know is service is the PITS on that line. Tonight after 7pm, the train CRAWLED... CRAWLED some more to 145th. CRAWLED to 168th, then 175th, and then the stupid conductor mumbles an announcement that most of the train did not hear. I needed 181st or 190th. The train goes NON-STOP to 207th. People were livid. Took the same stupid train back to 181st. 30 minutes late to where I was going. Took me basically over an hour from Midtown. Just ridiculous. Seems to be the same crap with this stupid train heading north. I also don’t understand all of the honking. Each train acts like there are track workers on the tracks so we must CRAWL from 59th all the way up. If it was going slow and honking, then there must have been track workers; and they can be extensive on a line like that. I agree, there's way too much of it and nhe rules have gotten even more restrictive and extensive. What they need for that is more FasTrack, but I think they're letting that program run out, as it's a money expenditure that's not always financed. (Don't know why. It should be just a matter of consolidating many work projects in an area, and not running service, so it can all be done safels and with less disruption of running service). But this goes on every time I go up there now and it is still during the tail end of rush hour. I think I’m going to take the BxM1 and backtrack. That’s apparently what some people have started doing now. Ridiculous. Prospect Park to Brighton Beach in 15 minutes on Brighton express is normal. The only timers between the two locations are north of Kings Highway on the SB express track. The Q with R160s only takes slightly more time, but that's mainly because it makes more stops. It's too bad the 7 express runs between Woodside and Junction will never see the speed they used to before those switches at 74th Street were installed. It'd be great if that speed restriction could be looked at again. The crawling is what makes any trip on the subway frustrating and worthy of avoidance! This is why I avoid the QBL after 8PM. One of the Board Members thinks the drop in ridership is because of the "wall of service advisories" but no, its the CRAWLING. Wonder if those timers on the exp between Franklin and Atlantic n/b were tweaked for faster speeds as well.. Earlier today I was on a that was moving at what felt like 30-35 compared to the usual 20-25 on that stretch. The only significant slow down was for the timer at Atlantic. I don't believe that there are GTs entering KH on the express -- on the local sb though. Beyond those, the only other GTs that come to mind in that stretch of Brighton are those protecting the interlocking north of Brighton Beach. The crawling speeds below Central Park West concern me mainly because the will be receiving CBTC between High St. and 59st within the next few years. 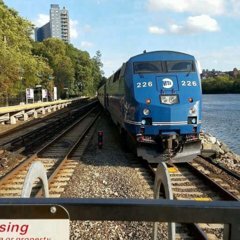 If you have a bunch of fast-moving and closely spaced trains in Midtown- what will happen when they reach the timers on Central Park West? Will they slow down and space out- causing a chain effect that slows down trains on Eighth Avenue and Fulton St? That would essentially make CBTC between High St. and 59st much less useful- since it would mainly benefit the and not the . Well usually once CBTC starts timers disappear because the computer is operating the train. CPW is going to probably be one of the last locations to get reconfigured. They know CPW can easily be a speed zone, that's why they have so many timers, almost telling operators, "nope don't even try it". The can't run more than about 18tph because it shares with the and . That isn't a signal issue as much as it's a routing issue -- to fix that, you have to separate Fulton Local from Fulton Express, and reorganize service accordingly. But it's an express run, it's supposed to be a speed zone. Yesterday, the NYCT Subway Twitter proclaimed the new speed restrictions were live on the Lexington Ave line leaving GCT N/B. Anecdotal evidence from my one ride on the 5 yesterday shows that operators are traveling through the area quicker than the usual crawl they go through when traversing the non-revenue switches. The new speed restriction on the n/b out of Times Square (the s-bend where Track 4 from the 42nd Street Shuttle merges) definitely seems to be working. All the years I'd ride the , I'm so used to it braking for that s-bend north of Times Square. Came back from out-of-state a few weekends ago, rode a n/b to 242nd for the first time in what feels like forever. I legit did a double take when the was accelerating out of Times Square (and didn't slow down) much faster than I remembered. A 20 MPH increase! Can't wait to be on the R179s through there! Does anyone know if they're going to address the southbound crawl on the Through Franklin to Chambers? That old limit was for entering Utica on the s/b local, not leaving n/b. How fast did the new speed leaving Grand Central go up to? I've never seen a train leave THIS station this fast, and if this is safe then all curves should be safe at this speed. Ah okay. Most ignore that speed limit anyway. That video is over 10 years old. It truly is amazing what a few miles per hour can do. All of my trips have been faster and it's thrown off my timing. For the first time in three years, I'm allotting too much time and that's a great thing.